You've sung the words, "where the deer and the antelope play," but the irony of the lyrics, or the difference between the two animals may not have occurred to you. They're rudimentarily similar, but deer and antelope have multiple distinct differences, including scientific classification, physical appearance, physical abilities and native habitat. Despite similar appearances, deer and antelope belong to two different scientific families. While both are members of the order Artiodactyla, which is composed of even-toed hoofed animals, deer belong to a family known as Cervidae, which is composed solely of deer species -- 47 of them, to be exact. Antelope belong to the Bovidae family, which includes 135 species of miscellaneous cattle, goats and antelope. One easy way to tell these animals apart is to look closely at their natural headgear. Both male and female antelope grow one set of permanent horns, which may be straight, ridged, curved or twisted. Antelope use their horns as a defense mechanism in order to fight off predators or rival animals within their own herds. Only male deer have the ability to grow antlers, which take on a branched appearance and are shed every winter and regrown the following spring. Antlers are used to impress female deer and in displays of dominance against other males during mating season. When it comes to natural habitats, the vast majority of antelope play in Africa, where 71 species are native to the continent. They are common in Asia, which has 14 native antelope species. Only the pronghorn antelope is native to North America. Deer are native to every continent in the world except Antarctica and Australia, where they were introduced in the 1800s. 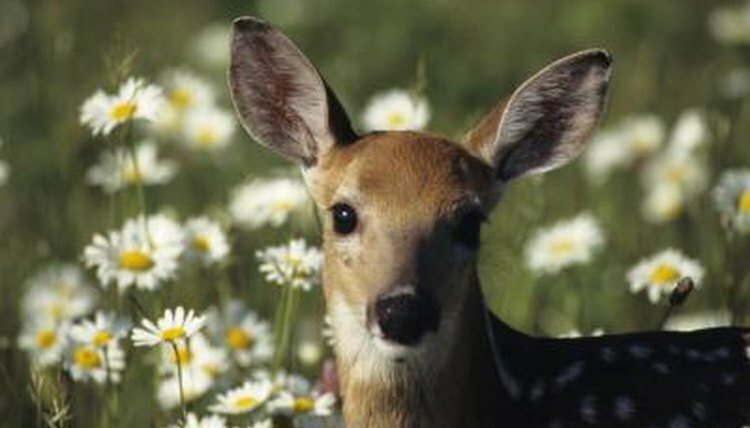 Common species of deer such as the white-tailed deer run a top speed of 35 miles per hour, and can only maintain that speed for short distances. Certain types of antelope, including the pronghorn antelope, can give cheetahs a run for their money, topping out at 53 miles per hour and maintaining speeds up to 27 miles per hour for long distances. University of Michigan Animal Diversity Web; Cervidae; Katie Holmes et al.